Have you ever heard of Tom Danielson? Admittedly, I had not, but maybe I should have as he was the Team Discovery cyclist who won the Tour de Georgia this year and just came in 8th in La Vuelta a España. Plus, he is one of Colorado’s pro-cycling homebodies, being a resident of Durango with some Fort Collins connections. 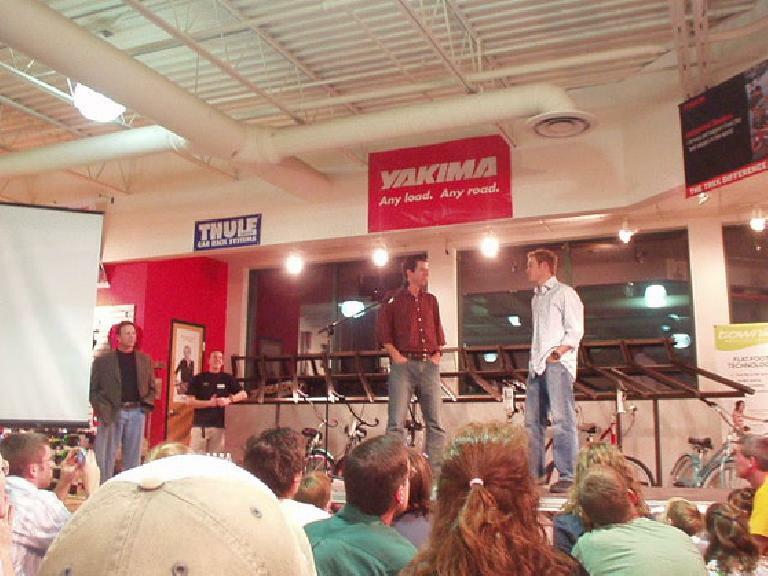 It came as no surprise, then, that 300 or so cycling enthusiasts poured into Lee’s Cyclery in Fort Collins to get a glimpse of the boy wonder who, word has it, just might be the next Lance Armstrong—his (now former) teammate and idol. To top off the event, Mike Sagan, the lead product designer and engineer of Trek Bicycles’ Advanced Concept Group, presented Armstrong’s 2005 winning time trial bike. 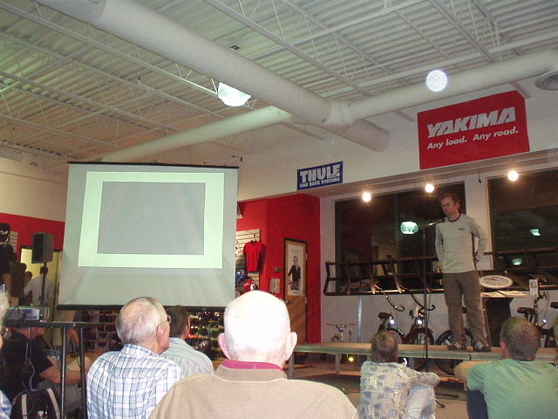 After Tom spoke, Mike Sagan commenced his PowerPoint presentation of his 8 years at Trek. His presentation was particularly interesting to me as mechanical design is what I had been and will be doing as my line of work. Trek’s proprietary OCLV has strength-reducing voids of less than 1% in their carbon fiber weave, which is far less than the aerospace standard of ~10%. Before 2001, Lance would ride a titanium Litespeed manufactured by GT with Trek decals on it during the time trials of the Tour de France, which caused some embarassment to Trek and prompted development of Trek’s own Time Trial bike. Lance’s 2005 Time Trial frame was designed and manufactured in just 4 weeks (vs. the standard 12-month cycle) by Trek. Hey Felix — Great write-up as usual. You should consider being an author. 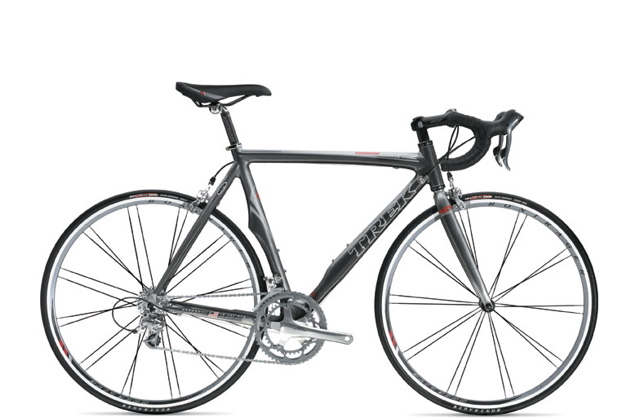 One minor correction though, having just gone through the purchase process with Trek. The Madone SL uses OCLV 110. The regular Madone uses OCLV 120. They save the OCLV 55 for the Madone SSL, which costs something like $7500. 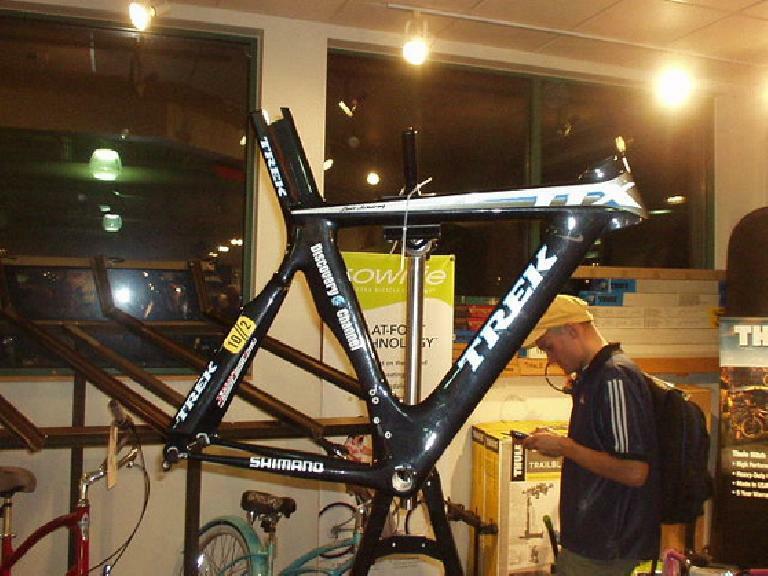 You mentioned Lance’s TT bikes, but let’s not forget Lance’s actual TT Trek in 2001 – the one with the water bladder INSIDE the frame. Talk about squirely.